The first time I heard of the name Brian Clark is when I watched the DIY solar panel instructional videos from Green DIY Energy. That was about a year ago. During that time, the power utility company just raised the power rates and I was paying a large sum of money for electricity at home. I wanted to learn how I can use solar energy to supplement the power needs at home. Hence, that has lead me to purchasing the Green DIY Energy manual. There were 6 high definition (HD) videos on homemade solar panel that come with the program. Brain was the host and he gave a very clear and concise instruction in the videos. I did a further research on Brian Clark and found some interesting information. Brian and the GreenDIYEnergy team have been going around impoverish communities and teaching them how to make residential solar panel. He has conducted solar workshop teaching people new skill on build solar array so they can make a living from it. In the year 2009, Brian and his team have been to Cochiti Pueblo in New Mexico, PineRidge, Indian Reservation South Dakota and Uganda, Africa where they conducted the solar workshops. Through the SolarGoodWill.org web site, Brian Clark is sharing his specialized knowledge on solar power and teaching people how to generate electricity from the sun. In some rural communities, they have no access to electricity and their only option is solar power. If you would like to give a donation, you can do so at the SolarGoodWill.org web site. Here’s some great news. Every dollar you donate, Green DIY Energy will match your donation up to $1000. For more information about them, check out the Green DIY Energy review on this blog. 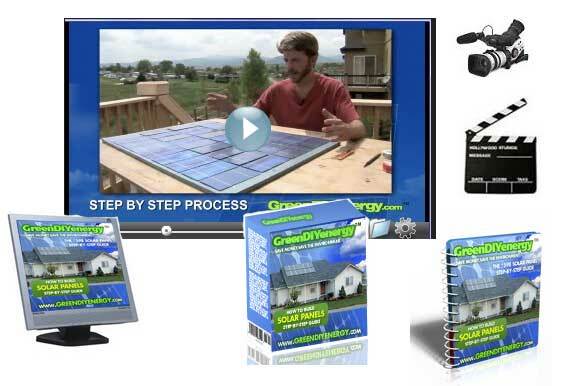 You can also get access to Brian Clark’s step by step DIY solar panel videos. To start making your own DIY home solar power system, sign up to our newsletter and get a copy of “30 Solar & Wind Power For Homes Videos” ebook for free. 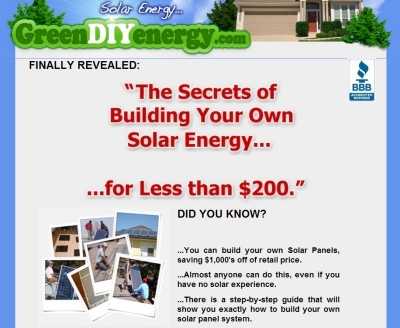 The ebook will provide links to videos showing you how to get start on a home solar energy project. To sign up, just enter your name and email into the form located on the top right corner. Let me tell you that we can find a way for developpeing short course in term of 2 days work shop. Just an idea. I am cameronian leaving in Charlottetown Prince Edward Island. I have some ideas. I would suggest you to contact Brian Clark of the non profit group Solargoodwill.org. You can share your idea with him. Thank you Will. I am contacting Brian. I have purchased before. I felt good about ordering from greendiy. However this lastest thing about power capacitor I ordered and never got the merchandise. Some charge from canada? My credit card company is in dispute. I am afraid to order from Greendiy anymore. I have left emails, etc. and no one returns my call. How can I get in touch with Greendiy? The email you sent concerning the “power” capacitor…via a Mr. Powers was very misleading. I ordered one “deal” aka 3 devices each, was charged for two, and now received two out of country charges of $1 for some conversion fee for Canada for a product I never received. Moreover, I left messages on the number appearing on my credit card and never has so much received a call back. It is my hope that your company is going to do something about these practices. I would welcome the opportunity to speak to you about this at any time. Please check your inbox.. it has my phone number. There is not free lunch in life. You get what you paid for and most people are not ready for an off-grid solar home. make all the panels you want. Batteries and BOS are where the real cost is. Do you research and do it well.